I really wish I could find the inspirational drawing for this blog post, but my feeble mind cannot remember with such exactness any more. I can, however, describe it for you. I saw a picture of a corn stalk, and at every leaf joint, the artist/cartoonist/whoever, chose to put a golden ear of corn! There were like EIGHT ears on a stalk! I'm not making this up! 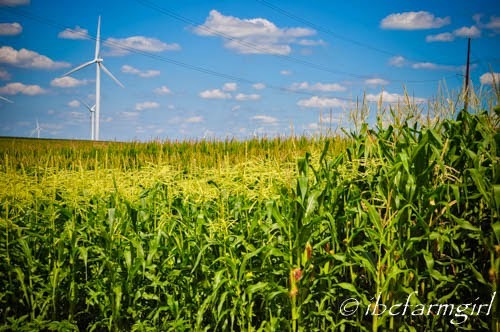 Here's a question for you dear readers: How many ears of corn does one corn stalk produce? One? Two? Three? Eight? Ten? 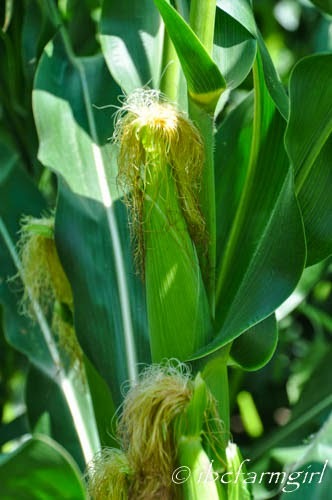 Ear number and size can vary greatly from cultivar to cultivar. 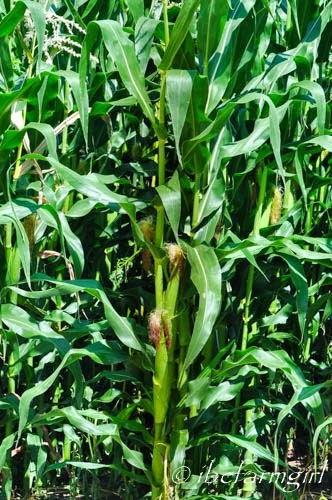 Most sweet corn varieties will have one to two ears per plant because they are mature rapidly and are generally short statured plants. 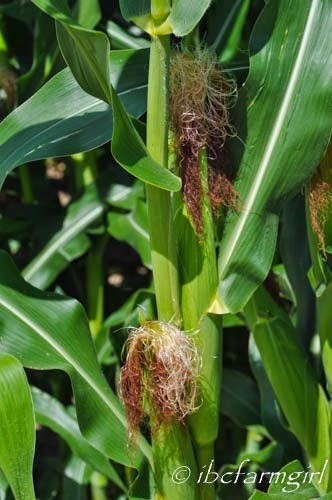 * Early maturing sweet corn will have one ear while those that mature later have two harvestable ears. Commercial corn growers only harvest the first ear because the size and quality of the second ear is inferior. Ear quality (size, flavor, tip fill) depends on temperature during pollination, plant nutrition and water availability during ear growth. 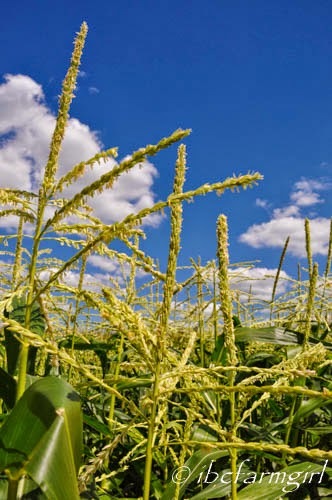 * Field corn, which is used for corn oil, silage and corn flakes to name a few, generally has from one to two ears. Field corn contains high amounts of starch and low sugars so fresh eating quality is poor. Field corn can cross with sweet corn, making some of the sweet corn kernels starchy and flavorless. Ear size is larger than sweet corn since field corn grows taller and for a longer time. * There are specific selections of field corn that produce six to ten ears per plant. These varieties were selected specifically for the production of baby corn which is used in stirfry and salad bars. 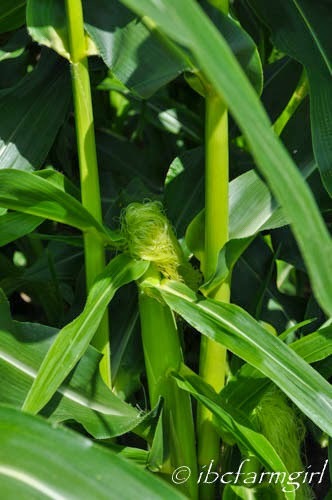 Baby corn is harvested from regular corn plants when the ears are very immature. The ears are harvested one to three days after the silks emerge. At this early stage, yields are very low. 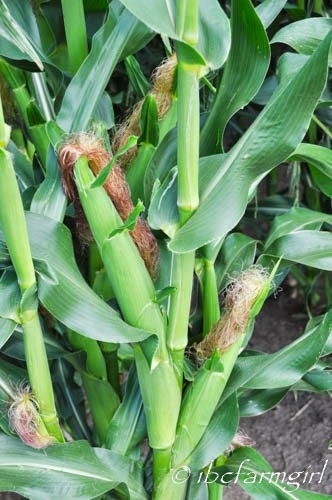 Growers of baby corn use varieties that produce many ears or plant at very high numbers of plants. Since production costs are so high, very little baby corn is grown in the United States. This one is interesting.....the number is within the answer of one or two, but it does not grow out of the top of the stalk! Hmmm.....This one has the ears kind of in the right place on the stalk, but the top most ear is too high. The stalk would probably blow over if it existed around these parts! This artist has one too high and a fourth ear coming out of the leaf? And this one belongs in a fairy tale! Our corn usually has two ears on each, but there is usually one dominant ear and one lesser ear. See? There isn't an ear of corn shooting out from the top of our corn plants. This is the tassel, full of pollen that will fall onto the silks of the ears and pollinate them so the ears will grow. And you might be able to tell that there are TWO different kinds of corn planted and growing in this picture. Any guesses as to what kind of corn the shorter plants are? You are soooo awesome! Of course it's Indiana Sweet Corn! And as usual, it looks to be heading to full buttery delight about the time our fair starts! Looks like we will be quite busy one day about a week from now! Honestly, it's quite busy around here every day at the farm. This past week we have cut, raked, and baled grass from our waterways and hauled them home. (This is about a three-day process if the rain clouds are "forever in your favor!") The wheat was cut, straw baled and stored from part of the 19 acres we had. The other part received a healthy dose of "fertilizer" compliments of the cows on our lots. 4-H cows walked for two hours each morning for three mornings then walked, washed, brushed, fed and watered by the girls all of us. 4-H projects due this next Saturday were closer to completion and record sheets are filling up. One last little funny from the farm...... One of the highly valued young men who came out to help work the straw racks asked Tall Guy what he did at his other job..... Several farmers do have other jobs to help with insurance and money for years when the crops do not produce their best..... Tall Guy told him that his job around the farm fills his days and could take about every hour in some parts of the calendar. His innocent question was a good one, and it also inspired this blog post because farmers and what we produce seem to fall under several misconceptions. If YOU have any questions about what we do on the farm and/or how we do it, please ask them! That's kind of what this whole blog centers around. This is also the season of county fairs, and I hope you are able to go out and visit the hard working kids and their exhibits at these fairs. Kids and their families put a crazy amount of hours in to most of the projects you see. We are getting ready for ours. Projects are due the 19th, and the fair kicks off on the 23rd. If you don't hear from me for a little while, I promise you I am knee to neck deep in 4-H projects. Hope to see you at our fair or hear that you went to your county's fair! Good luck at the fair! Can't wait to see and hear all about it! Whew! We Survived the Benton County 4-H Fair!